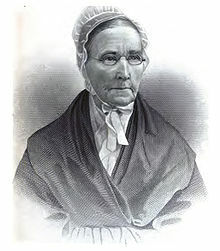 Levi and Catherine Coffin were Quakers that came to Cincinnati in 1847 . He was called the “President of the Underground Railroad” and was a public face of the Abolitionist movement in the 1850’s . Originally from North Carolina, they moved to downtown Cincinnati to open a “Free Produce Store” which sold nothing made by slave labor. Soon after arriving, Levi joined the Vigilance Committee that had been formed to protect free blacks in Cincinnati where he tapped into the longstanding network of “organized, cooperative fugitive slave assistance in Cincinnati’s black community from the late 1820s” [1 ] These contacts, combined with Coffin’s Quaker abolitionist community in Indiana, formed a strong, interracial network that became the Underground Railroad through Cincinnati to Canada. 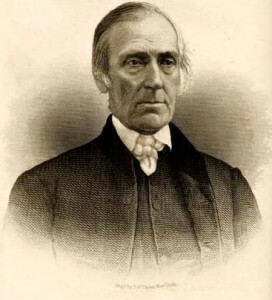 At least five young Quaker men from Coffin’s Indiana anti-slavery community came to Farmers’ College in College Hill to study. The story of the “Escape of the 28” through College Hill and Levi and Catherine Coffin’s role in this well documented escape can be downloaded here. Catherine was a member of the Cincinnati Anti-Slavery Sewing Circle which provided clothing to those escaping who couldn’t carry much with them and whose clothing was in poor condition and identified them as fugitive slave. Catherine Died May 25, 1881. Theophilus Wilson, son of Samuel and Sally Wilson of College Hill, was a pall bearer at her funeral and the executor of the Coffin estate. Catherine was buried at the Friends burying ground in Cumminsville and was later reinterred with Levi in the Quaker plot in Spring Grove Cemetery. 1. Nikki Taylor, Frontiers of Freedom Cincinnati’s Black Community 1802-1868 (Athens, Ohio:Ohio University Press, 2005) p. 147.